NICHOLAS AIR congratulates David Frost, winner of the 2015 Mississippi Gulf Resort Classic. 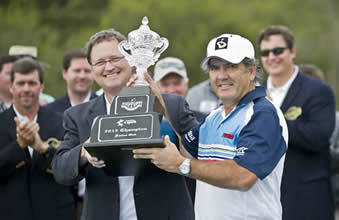 The tournament was held March 26-29 at Fallen Oak Golf Course in Biloxi, Mississippi. NICHOLAS AIR staff had a great time at the tournament, sponsors dinner, and a special behind the scenes look at the production of the Golf Channel. We are already looking forward to next year! NICHOLAS AIR is proud to announce the arrival of a new 2015 Phenom 100 that entered service April 1st. Shown in the picture is our new Phenom 100 being built on the factory floor.